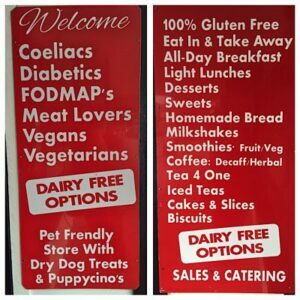 Evie’s Cafe in Trafalgar, Gippsland is a great stop off if you are a coeliac, but also for those with other dietary requirements. It is 100% gluten free and caters for vegetarian, dairy free, low FODMAP and more! If you are not familiar with Victoria, Trafalgar is in West Gippsland, 120km east of Melbourne. It lies between Warragul and Moe, not far from the M1 freeway. It only takes us around 1.5 hours from suburban Melbourne as it is freeway most of the way. 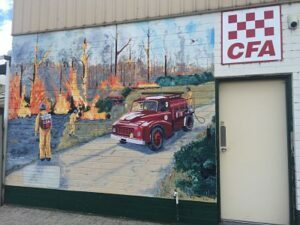 If you are a tourist, it is close to the quaint little town of Nar Nar Goon which is famous for its murals on buildings. If you are going skiing at Mt Baw Baw, it could also be a worthwhile diversion. We stop off on the way to Lakes Entrance or Paynesville in Gippsland. Evie’s Cafe is located in the main (but small) shopping area and you can’t miss it with the signs shown below at the front of the shop! 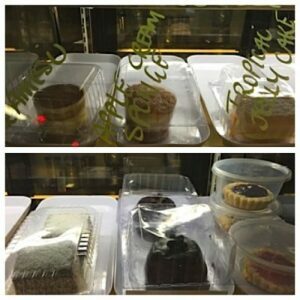 The cafe is owned and run by coeliacs and is 100% gluten free and allergy friendly. Most of the food is home cooked and prices are reasonable. There are no artificial colourings, preservatives, food enhancers or additives used in Evie’s cooking. The cafe itself is small and casual where you can eat in or takeaway. There are also some tables out the front, so you can sit outside if is a nice day or if you have your dog with you. We usually get a take away and eat in the car to keep moving. My husband and I usually have a pie (beef & chilli/beef & bacon) and a sausage roll which are warmed up for us. 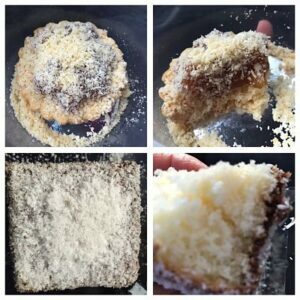 The pastry and fillings are both great and my non gluten free husband really enjoyed both. 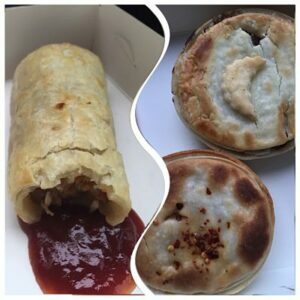 I believe the pies and sausage rolls were also dairy free and some are also fructose friendly, provided by a 100% gluten free bakery in Melbourne. Dessert for me was an impressively large lamington and for my husband a fruit tart, which he really enjoyed. If you are eating in, the menu offers light breakfasts/brunch, morning/afternoon teas and light lunches. 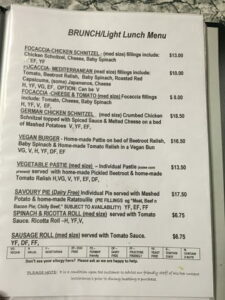 Below was the first page of the lunch menu when I first visited, but it does change regularly and there are specials available in the cabinets. The chicken schnitzel focaccia looked great! 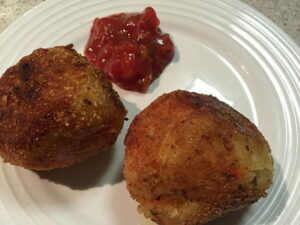 I bought some sundried tomato arancini balls to take home for an easy dinner, and they were great with the tomato relish that was also provided. The food in the display counter is stored in separate containers to ensure there is no cross contamination for people with issues with ingredients other than gluten (eg coconut) and the staff can tell you all the ingredients. There are plenty of vegan options. 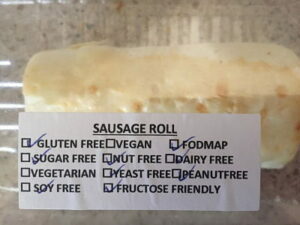 Many items are labelled like the sausage roll below so you can identify products suitable for your special requirements. You can enjoy a wide variety of hot drinks (coffees, teas, hot chocolate) and cold drinks (spiders, milkshakes, smoothies), many of which are dairy free. Your pooch can even have a puppycino! In the spring and summer months you can enjoy home made vegan gelati. 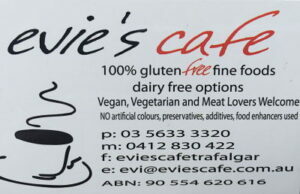 For Gippsland gluten free, Evie’s is well worth calling into, along with the nearby towns of Nar Nar Goon and Yarragon. *If you are making a special trip, please ring first as sometimes they close early. This post was last updated in July 2018. Good luck convincing him – I think it makes a pretty good day trip from Melbourne!